Everyone say Yay! Hip Hip Hooray! 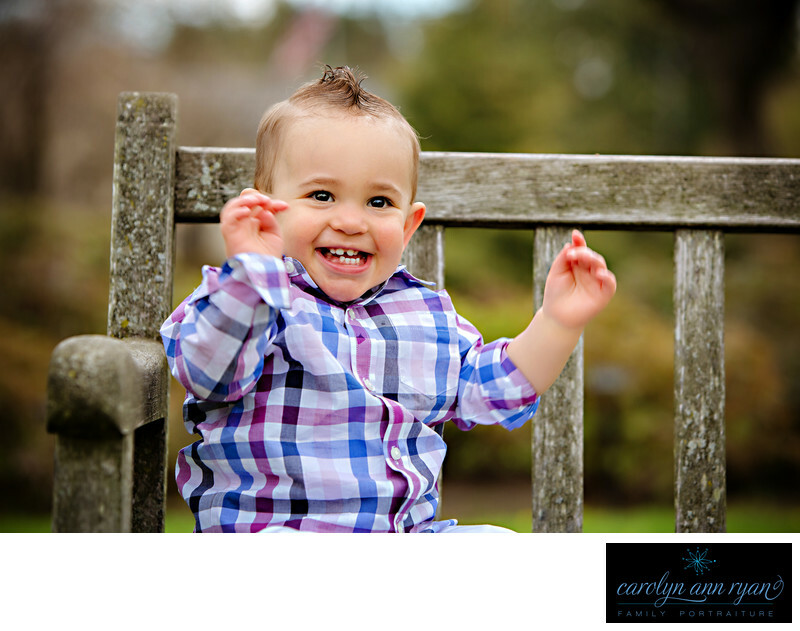 Now, which do you love more – the cute little baby teeth in this little toddler's adorable smile, the awesome spring plaid shirt with blue and purple or his fantastic hair styling for his family portrait session? Yes, my answer is that I love them all! And I love that he felt like such a big boy sitting on that park bench! It was early spring in a botancial garden and this location was the perfect place to let this little guy just sit and big a big little man! He was so happy with our cheers for him! His smile and giggles were constant throughout the day, even despite his allergies that started to kick up due to the spring blooms in the garden.Keywords: boys (120), Easter (6), Janie & Jack (15), Navy (51), plaid (105), purple (24), Spring (48), timeless (54), toddler (39), toddlers (45). 1/320; f/4.0; ISO 200; 125.0 mm.